Ma Yansong‘s new museum for George Lucas wouldn’t look out of place on a Star Wars set. Renderings made public Monday show a white, undulating dune of sorts, its stone surface ascending into a metallic “floating” disc. Chicago will be the home of the famous director’s Museum of Narrative Art, to the chagrin of some Californians who had hoped his collection of paintings and movie memorabilia might land in San Francisco or Los Angeles. The lead designers are MAD architects, the Beijing-based firm of Ma Yansong. Local darlings Studio Gang Architects are working with MAD on the lakefront project, along with Chicago’s VOA Associates. A spokesman for Studio Gang said Jeanne Gang‘s portion of the design would be released in 2015. Museum representatives announced the international design team’s identity in July, but renderings only appeared online in early November. The “floating” disc atop the building will feature an observation deck, offering 360-degree views of the surrounding area, including Lake Michigan. 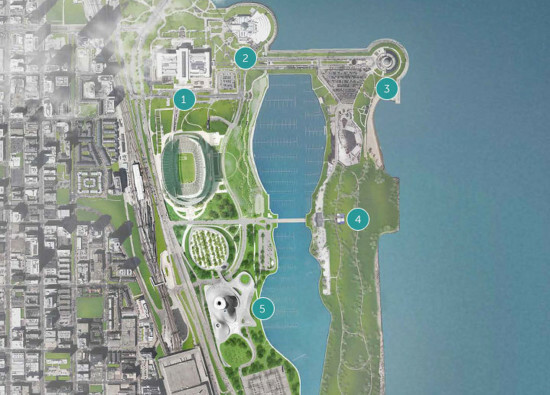 Studio Gang “will design the landscape and create a bridge to connect The Lucas Museum to Northerly Island,” according to the project’s website. Northerly Island is currently the subject of a massive makeover by Gang that aims to turn the southern portion of the 91-acre peninsula into an ecological park. The website says a live webcam will broadcast the project’s construction. 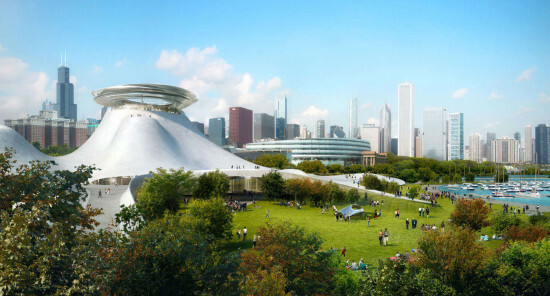 The museum’s fanciful design is unlikely to cool tensions with the group Friends of the Parks, who have challenged the museum development under Chicago’s 1973 Lakefront Protection Ordinance. A formal presentation to the city’s plan commission and council is expected next year, but opposition to this private development of lakefront land is likely to continue—especially now that it has a face. June 26, 2018 Will a proposed addition turn Chicago’s Union Station into the new Soldier Field?